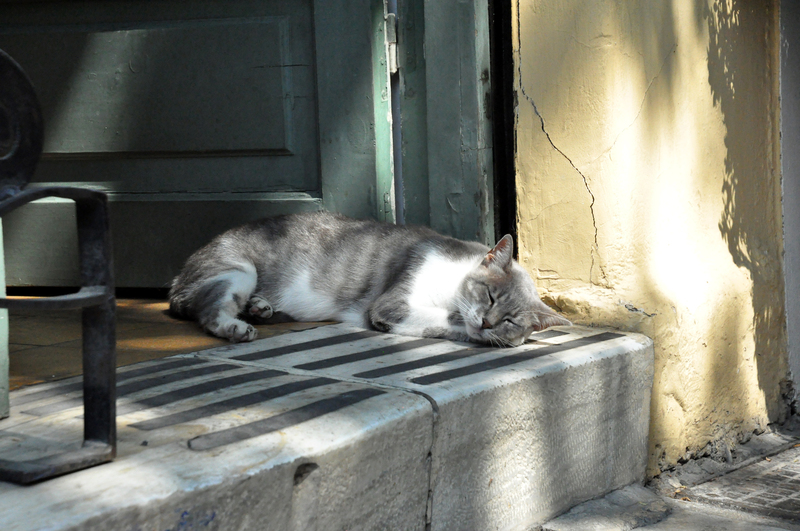 One of the greatest (and saddest) parts of our trip to Greece was being constantly surrounded by kitties. They were all super skittish and didn’t want anything to do with my unsolicited petting, but I still always tried. I wanted so badly to save them all! 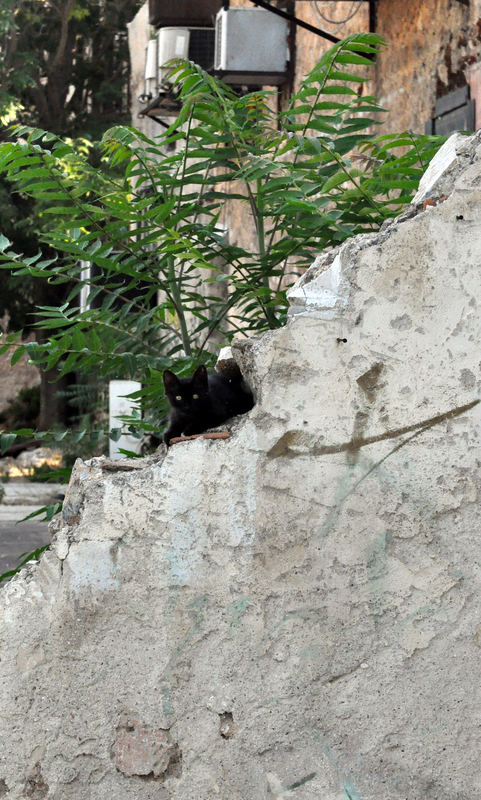 Pretty much every part of the city is inhabited by colonies of feral cats. Most of the people ignore them, but every once in a while you stumble upon an abandoned store front that is littered with cans of cat food and bowls of water. It makes me warm and fuzzy to know that a hand full of people out there take time to make sure that a few of these unwanted pets have what they need to survive. Aww, I'm just like you… I want to take every single one home with me and save them! Too cute! This is so sad. 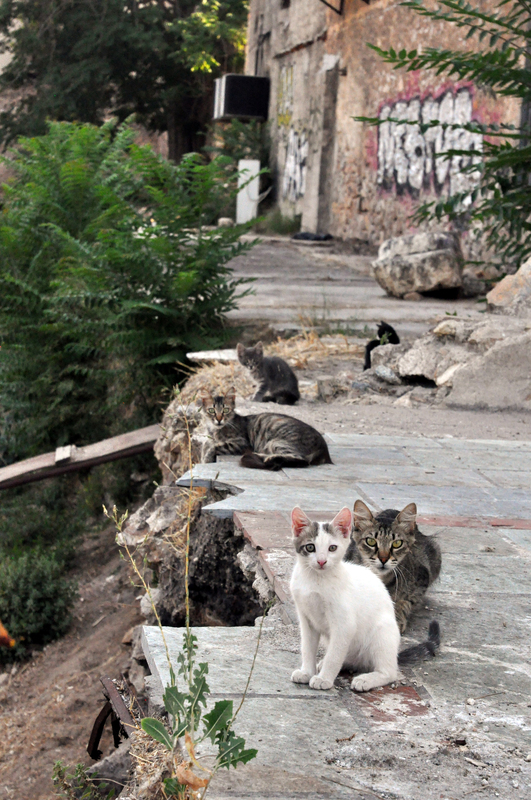 I wish they would do something to catch/spay/neuter them to help with the problem. I'm just like you, though. I want to rescue them all. I felt the same way when I saw all the wild/abandoned dogs roaming around Mexico last year. I wanted to take all of them home!! That made me sad! I wish they all had homes 🙁 Or that people could somehow donate money to get them spayed and neutered. So, so sad!Me and my husband actually got a kitten last night, haha. We should have just went to Athens and brought a couple home..
That makes me really sad, but I remember that when I was in Greece. Italy had a lot of dogs. I want to give them all homes!Love your blog btw. This is absolutely heart breaking. Hey Anna. Thank you for your blog. 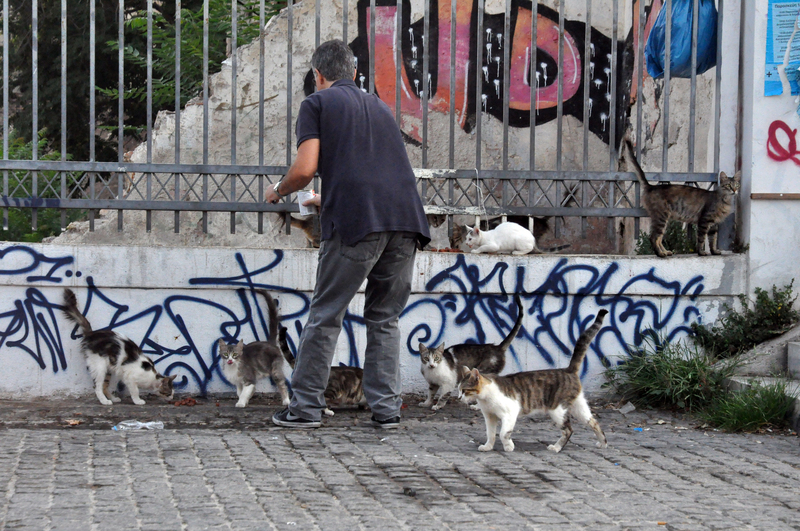 Every once in a while I google to see new tourist reports of naples' stray cats, that's how I found your blog. I am in Maryland, USA, and sitting right next to me is a former Naples feral kitten. She is now – gulp- 15 years old, and she is my beloved princess. Her name is JuJu. I rescued her whole litter, they were very sick, when I was on a trip there in 2000. They were teeny. I brought the four survivors home with me, two were adopted by an Italian couple living in Philadelphia who liked the idea of Italian cats. Tow, JuJu and her sister Miracle, I kept. 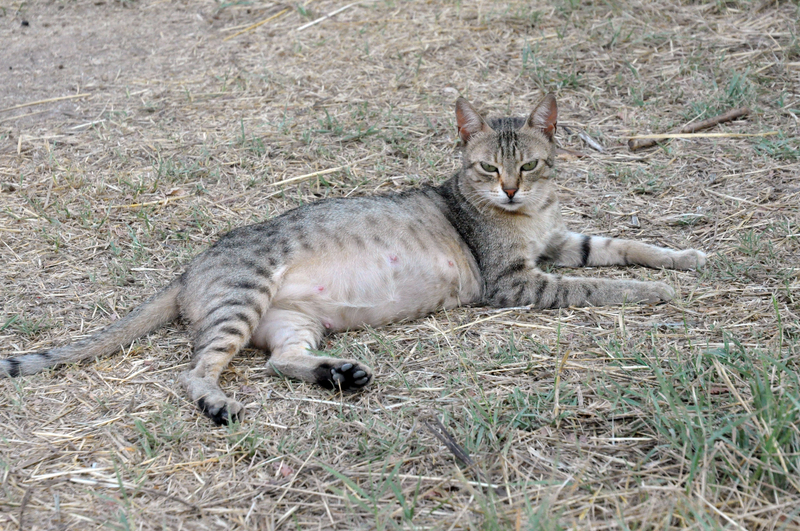 Unfortunately, I didnt know that the oncovirus commonly called the feline leukemia virus, is very common among these Italian cats. When JuJus sweet sister Miracle died in 2013, at 13 years old, I learned she had the virus. I then learned that JuJu has it too, and so does one of their sisters, Luna, who lives in Philly. But JuJu and Luna both have been able to keep the virus in a dormant state, a battle Miracle lost. It is still 13 years Miracle would not have had if I didn't give in to the urge to save them. I can't believe JuJu has made it to 15. 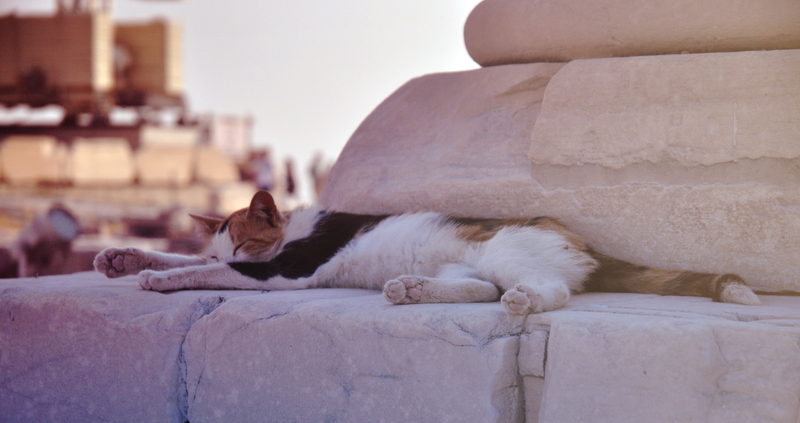 She is the smartest cat. 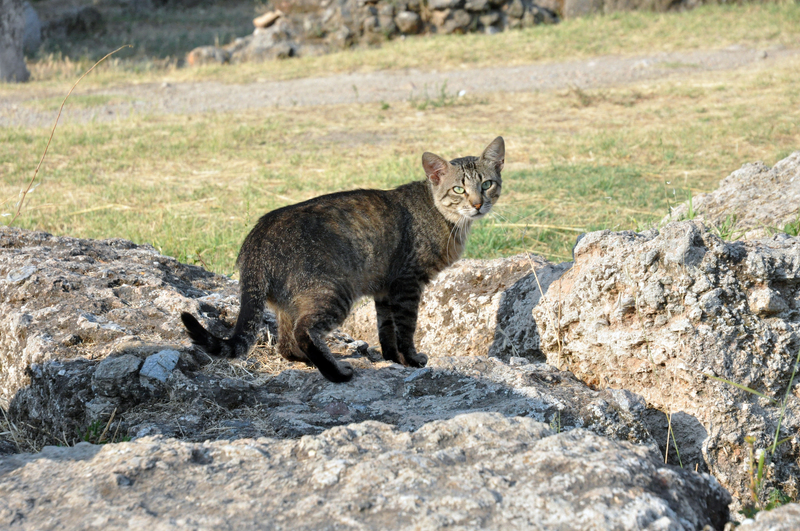 I am convinced that due to natural selection, these ferals of Italy are smarter than normal american cats. Their ancestors had to be to survive. I am tempted to come get another one when I no longer have JuJu. But I probably won't, Naples is scarier than it was 15 years ago. Just thought you'd like to know, some made it out. Juju is very, very loved — she is the boss of me!